UPDATE: I’M SORRY THAT THE SNOW PLUGIN IS OUTDATED. COMPIZ HAS UPDATED TO 0.9.x IN LATEST UBUNTU’S REPOSITORY AND IT’S KINDA DIFFICULT TO LET IT SNOW USING COMPIZ PLUGIN. 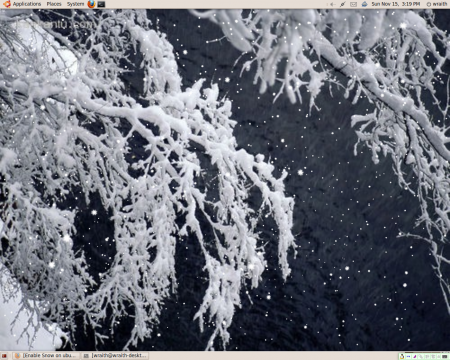 This tutorial shows how to enable snow on your ubuntu desktop using compiz fusion plugin.It is tested in ubuntu 9.10(karmic). 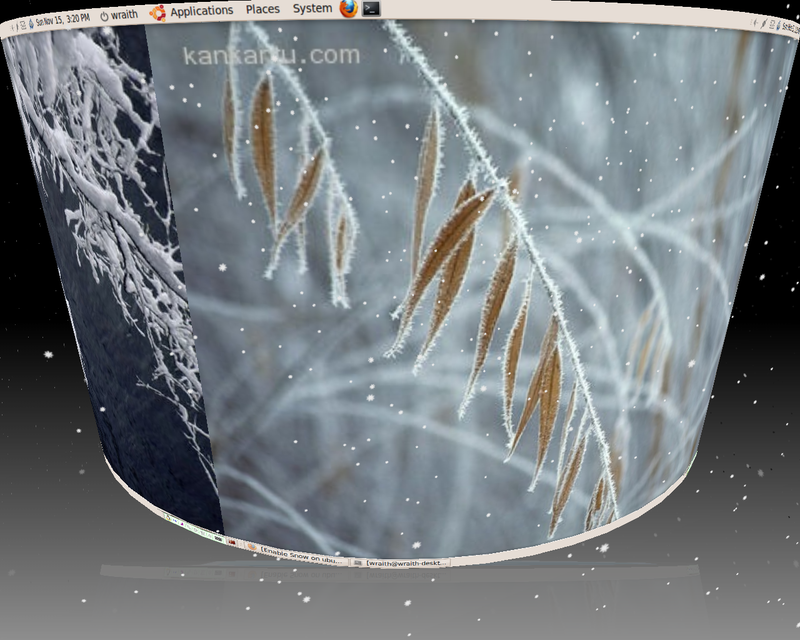 First,make sure you have compiz installed and enabled 3D effect.You can click here for this information. 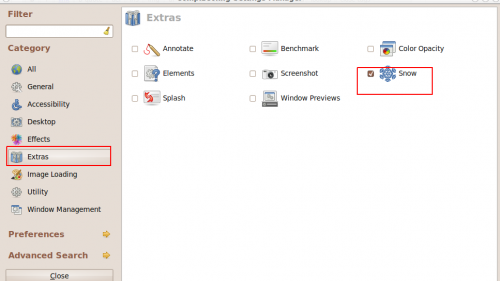 Previous deb package might be old for your Ubuntu, here is how to compile and install the snow plugin from source code. 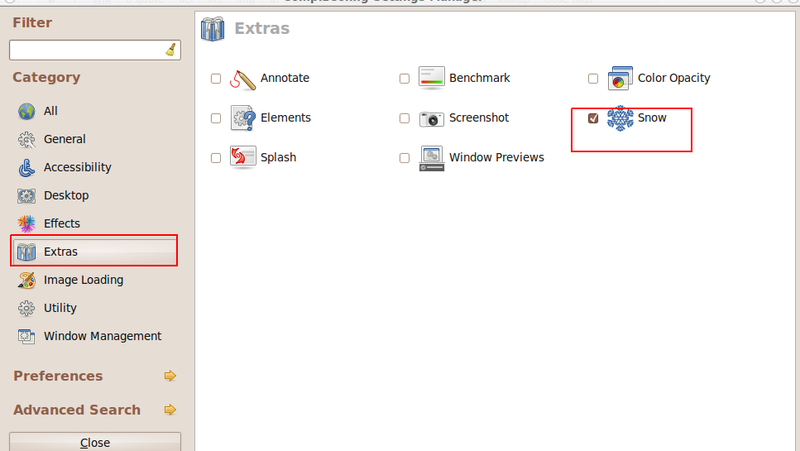 Now, open CCSM and you should the the “Snow” option in Extras. After this,open System->Preferences->CompizConfig-Settings-Manager.Tick Snow in Extra tab. Now,press win(Windows super key)+F3 key combination and see effect! 17 users responded in " Enable Snow on ubuntu desktop using compiz fusion "
I added the snow plugin for Compiz in Ubuntu 9.10 (64bit), then changed my background, skydome and caps for the desktop cube. I feel all festive now. woo hoo, nog! i am new to linux . and this finally solved my problem. i just installed nvidia,but now ubuntu is working in a low graphics and the 3d desktop effects are not working ,even after setting the visual effects to the ‘extra’ the optional is getting closed,am not able to get the 3d effect desktop,and where to find the graphic card got installed,can any one solve my problem. Fantastic, very simple and nice. Although it installed correctly, and I am able to effectively “check” it off, the effect itself does not enable when the binding ‘super+f3’ is used. I have even changed the binding to other key-combinations with no positive results. My other effects are working perfectly though. I am using Ubuntu 10.10 [desktop] on an Acer Aspire One. When I do “cd snow” and “make && make install” in terminal I receive: Makefile:48: *** [ERROR] Compiz not installed. Stop. Yet I have Compiz installed! Working w/ Ubuntu 10.10, thanks for your help!